10% discount on ALL rates for AAA members, seniors, or active military families year round. (Not available through online reservations. Please contact owner. Cannot be combined with other discounts. Must show membership card upon arrival.) Note: Periodic additional discounts offered throughout the year. Please contact owner to assure you receive the best rates when booking. * Rent 6 nights get 7th night free. Please contact owner via "Contact" link above to assure you receive the best rate available. A 13% county bed tax is added to each rate. All reservations are also charged a non-refundable $90 cleaning fee and a $39 damage insurance fee which are added to the total. 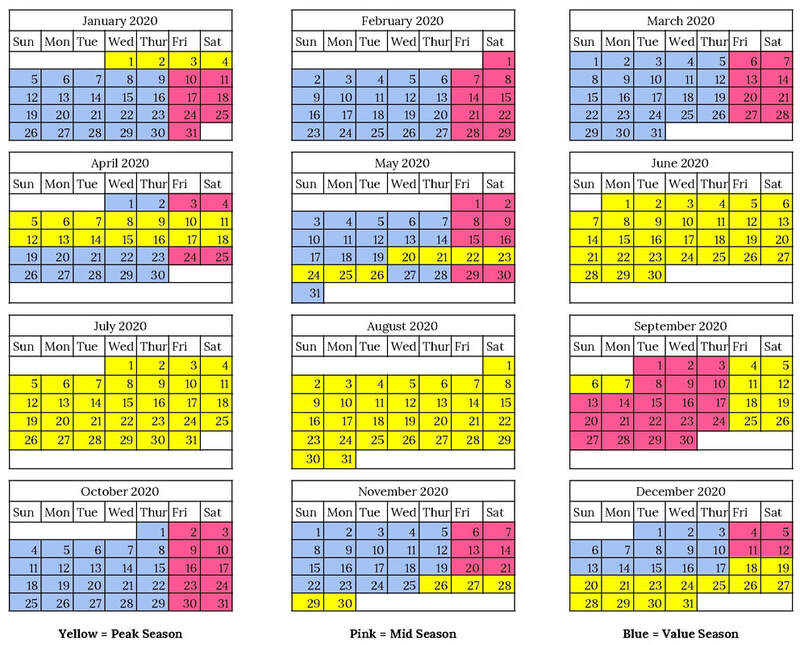 3-Night Minimum applies to peak periods in summer marked with Yellow Blocks. If you need to cancel your reservation, your deposit will be fully refunded less a $75 processing fee, so long as you notify us at least 30 days prior to arrival on your reservation. Once you are within the cancellation time frame, cabin changes and date changes (including dropping nights) are not allowed.